The STARGATE Mod is available free of charge from the Downloads section. In order to play it, all you need is the free gaming-platform Steam and the through it also freely available "Source SDK Base 2007" game engine. The whole story of The STARGATE Mod began in June 1999 with a small singleplayer map package for Unreal Tournament. After this singleplayer adventure was finished, fans in the Stargate community requested a sequel to the original map pack that should include even more elements of the Stargate universe. This is where The STARGATE Mod was born. The project was first planned for the Unreal 2 engine and then later for the UT2003 engine, but we finally decided to create it for the HL²/Source engine because of the improved possibilty to include up-to-date visual effects and AI tactics into the game. Since that point in time, we have developed a number of models, textures, sounds and maps for the project and the Mod is still not finished yet. The main reason for this long-time development is that we want to make the Mod as realistically as possible. 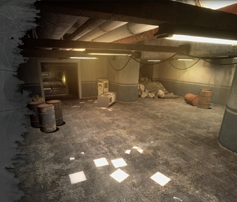 This means that the locations and characters known from the movies and the TV series should be represented as good as possible to ensure a maximum gameplay experience. As this project is so large, we are still looking for new members to help us in creating the Mod. If you are intersted in joining the team or contributing content, please fill out our application form. Thank you very much in advance!